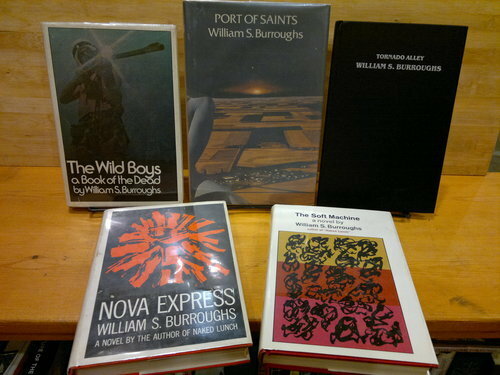 As previewed last week, this is our selection of Burroughs first editions. All of these are the first appearances of the book in that form, though not necessarily of the content. 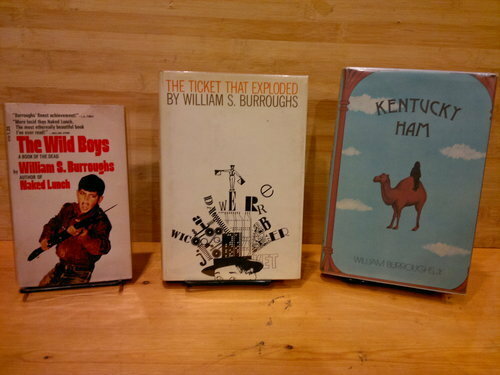 Some of these books are recollected in other publications, and some are collections of earlier collections—for example, White Subway, a collection of magazine pieces, is re-collected in The Burroughs File, but we have first editions of both. This initial picture shows some of the rarer firsts we have. In the middle is the first printing of the first edition of Naked Lunch, in the original, first-printing dustjacket This copy is in excellent condition, with very little bumping to the spine edges and only slight chipping on the dustjacket. It’s flanked by, on the left, a rare first edition of The Burroughs File, and on the right, by a true first, numbered edition of Early Routines (this one is from the unsigned, numbered printing). At the bottom of this image are first editions of two collections of magazine pieces, Roosevelt after Inauguration and White Subway. Here we have firsts of The Wild Boys and Port of Saints, with a first of Tornado Alley on the right (as issued without dustjacket). At bottom are firsts of Nova Express and The Soft Machine. This trio has my favorite cover art of all the first editions (hey, I had to come up with some selection criteria…). This is the first US paperback edition of The Wild Boys, followed by the first editions of The Ticket that Exploded and Kentucky Ham. Top and center here is Cities of the Red Night, flanked by the first UK (on the left) and first US (on the right) editions of Interzone. Finishing this set off are firsts of My Education, Burroughs’s dream journal, and Queer. 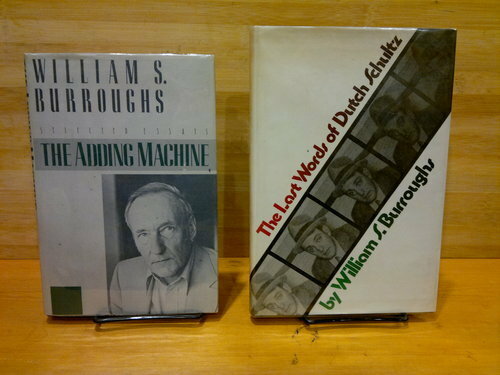 And last, here are first editions of The Adding Machine and The Last Words of Dutch Schultz. 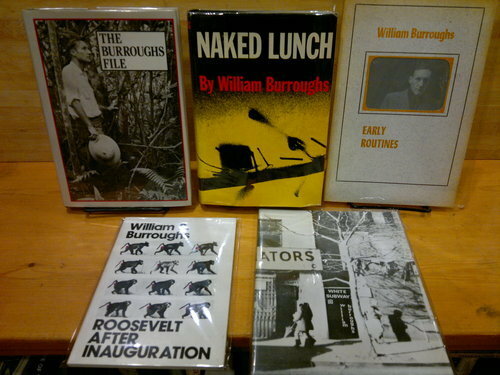 We have many, many more Burroughs books in our collection. 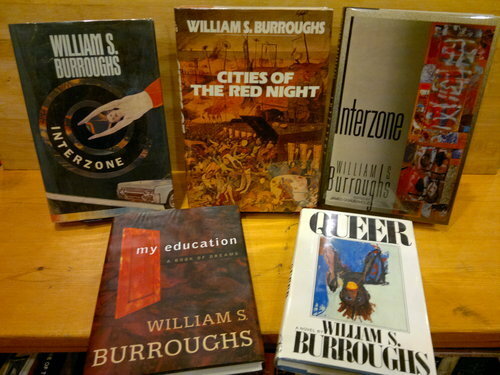 If you’re looking for something and you don’t see it listed in one of our posts, please email us and we can send you a complete catalog of the Burroughs items we have for sale. 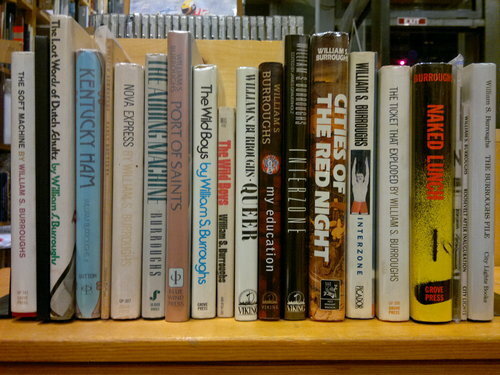 This entry was tagged beats, books, burroughs, first edition, rare, william s. burroughs. Bookmark the permalink.